Are you printing way more than your current copier can handle? Are you in need of something more powerful? 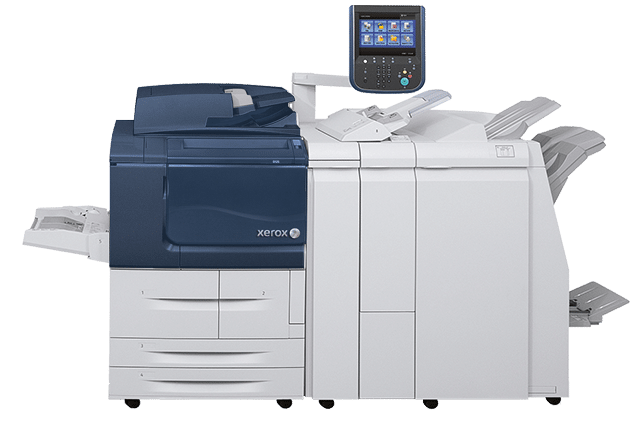 The Xerox D95A Mono copier is the perfect kit for businesses such as such as pay-for-print shops and centralized reprographic departments, education and healthcare. With the flexibility to choose your print speed, server options, and the media feeding and finishing capabilities that make the most sense for your business or organization. With a stunning high-performance copying/scanning capability at up to 200 images per minute you can count on this device to keep up with your demands. As well as a choice of high-speed print engines deliver output up to 100, 110 and 125 pages per minute. And with an outstanding 2400 x 2400 dpi print resolution this copier delivers consistent, high-quality reproduction of text, solids, photos and graphics, with exceptional registration for polished, professional results. Do you want your business to be more efficient in printing and still be able to reduce costs? Every component within the Xerox D95A Copier has been engineered for maximum uptime and long-life durability. With a minimal learning curve, the Xerox D95A Copier quickly begins delivering an exceptional return on your investment.